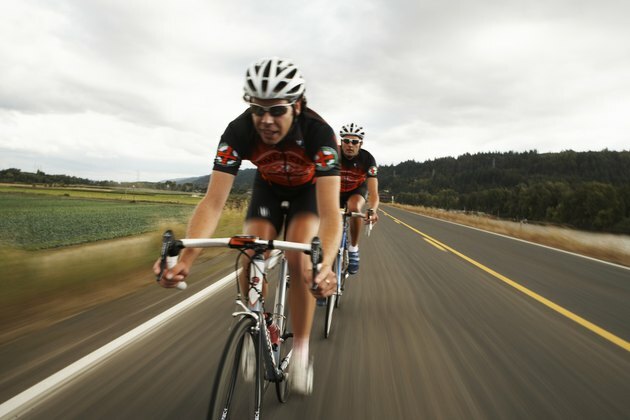 Riding a bike is a low-impact exercise, but knee pain for cycling enthusiasts is common. The health concern that readers of "Bicycling" most frequently write to the magazine about is knees. This could lead you to think that cycling is bad for your knees, but that's not necessarily true. You just have to have the right equipment and engage in the exercise correctly for cycling to be good for your knees. The repetitive motion of pedaling your bike without sufficient leg strength can potentially bring on knee pain and injuries. If cycling is the only exercise you get, your leg muscles are probably out of balance, with overdeveloped quadriceps and underdeveloped glutes and hamstrings. This imbalance stresses your knees, so strength training is crucial for keeping your cycling knees pain-free. You'll benefit from working all the muscles in your body, but a full range of leg exercises should be in your repertoire to strengthen the leg muscles that support and stabilize your knees; these include leg curls and deadlifts for your hamstrings, leg extensions and lunges for your quads, hip extensions and squats for your glutes, and calf raises and presses for your calves. A proper warm-up before any workout is vital, and it's no different for cycling. Even if you consider bike riding a hobby more than a sport or a workout, it's still exercise. Your knees and the rest of your body need to warm up before you start exerting yourself. Many times cycling itself is used for warm-up purposes for other exercise activities, so starting your ride at a slower pace and easing into a higher speed is an ideal way to warm up. Having a bike that is fitted for your proportions is vital for avoiding knee pain. If the seat is too high or too low, it can affect how much your knee has to bend and extend as you pedal. A seat that is set at optimal height will put your knee just past a 45-degree angle at the top of the stroke, and leave a slight bend in your knee when you're at the bottom of the stroke. Your feet need to be placed properly, too. Pedals that are too close or too far from the bike frame can cause knee pain, so adjust the cleats if necessary. You want to be able to center your feet on the cleats without discomfort, with your toes pointing forward. Sometimes age-associated wear, weight issues or past injuries will cause knee pain for cyclists no matter what precautions they take. If you have knee pain but love cycling and don't want to substitute another exercise for it, try a different bike. In his book "The Knee Crisis Handbook," published in 2003, Brian Halpern points out that recumbent bikes take the pressure off your knees and other joints by placing your body at a different angle than a traditional bike does. Most gyms have at least one recumbent bike in the cardio center, but you can get a recumbent bike for outdoor riding instead if you prefer fresh air and changing scenery to stationary riding in the gym. The Guardian: How Can I Stop Cycling Hurting My Knees?